By definition, construction companies must be in two places at the same time – at the office and at the job site. How well information is gathered from the field and compiled at the office is a key success factor in the industry. Cloud computing has the potential to accelerate and improve this process. In this article we discuss the definition of cloud computing, the affect it is having on construction industry technology, and the plans Sage has to leverage cloud technology. Being in the cloud is the latest catchphrase in technology discussions. It is used in reference to various technology frameworks, but what they all have in common is the use of the Internet. A cloud-based solution can be as simple as a remote server that stores data, allowing users to access the data via an internet connection. On the other end of the spectrum are fully functional software applications that are used outside of a company’s firewall. Because you can connect to these solutions from anywhere there is an Internet connection, these solutions lend themselves to use on mobile devices such as smart phones and tablet PC devices such as the iPad. Cloud-based solutions offer benefits beyond the workings of a single organization. The Constructech 2011 IT Survey noted that today’s construction professionals need to be highly collaborative. The word team has taken on a whole new meaning in the construction industry. Overall, construction professionals are becoming more collaborative, using technology to connect all project team members—from subcontractors to general contractors to owners. It is unlikely that each of these project team members will use the same back office business management applications, so your cloud-based solutions need to be able to exchange project information with many systems. 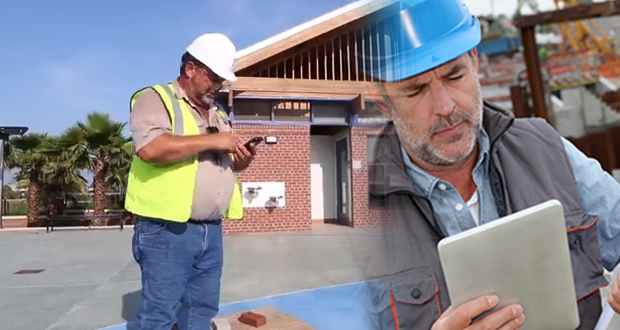 The Constructech survey also noted that contractors are taking information out to the job site with mobile devices that have been enhanced with a host of applications. The survey reports that today construction companies are carrying out project management, scheduling, managing punch lists, and completing time tracking tasks in the field. Of those surveyed, 81 percent use smart phone devices at the job site, 69 percent use laptop computers, and 26 percent use tablet PCs. There is no question that today’s business management solutions need to support the highly mobile workforce of the construction industry now and in the future. This doesn’t mean your construction company needs to scrap all its current software solutions in favor of cloud-based applications. However it does make sense to use cloud-based solutions to extend and enhance your on-premise software. Given the tough economic conditions of the last few years, it is even more critical that you get the most out of Sage 100 Contractor as you cope with fewer resources, fewer jobs, and more competition. In addition to continuing to enhance your on-premise Sage 100 Contractor solution, Sage is working towards offering you web-based tools that will help you better manage projects, communicate between team members and vendors, and deliver you the information you need no matter where you are. Sage will soon introduce web-based, construction-specific services that will connect to Sage 100 Contractor to further extend the investment you have made in your on-premise software. With secure and timely exchange of project information, you will be able to better manage your projects, communicate between team members and vendors, and deliver information whenever and wherever it is needed—in the office, on the job site, and at a client’s office. We will keep you updated about these new services as more information is available. Please call us with any questions. Open the 3-3 Cash Receipts window. In the Account box, type the cash account number. In the Deposit # box, type the deposit transaction number. In the Date box, type the deposit date. In the Description box, type a description. Enter either the Client or Job. Click either the Contract Invoices or Service Invoices tab. In the grid, locate the credit invoice and enter the amount to be applied as a negative number in the Paid column. Note: The Deposit Total currently shows a negative number and is in red. In the grid, locate the invoice(s) to which the credit is to be applied and enter the Paid amount. Once all Paid amounts are entered your Deposit Total should be zero. Please call us if you require assistance. DOWNLOAD PRINTABLE PDF VERSION HERE!